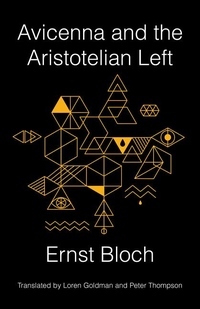 Ernst Bloch was one of the most significant twentieth-century German thinkers, yet he remains overshadowed by his Frankfurt School contemporaries. Known for his engagement with utopianism and religious thought, Bloch also wrote incisively about ontological questions. In his short masterpiece Avicenna and the Aristotelian Left, Bloch gives a striking account of materialism that traces emancipatory elements of modern thought to medieval Islamic philosophers' encounter with Aristotle. Bloch argues that the great medieval Islamic philosopher Avicenna (Ibn Sina) planted the seeds of a radical materialism still relevant for critical theory today. He contrasts Avicenna's and Aquinas's interpretations of Aristotle on form and matter to argue that Avicenna's reading democratizes power and undermines clerical and political authority. Bloch explores Avicenna's world and metaphysics in detail, showing how even his most recondite theoretical concerns prove capable of pointing toward radical social transformation. He blazes an original path through the history of ideas, including Averroes (Ibn Rushd), Spinoza, and Marx as well as lesser-known figures. Here translated into English for the first time, Avicenna and the Aristotelian Left is at once a succinct summation of Bloch's own idiosyncratic materialism, a provocative reconstruction of the Western philosophical tradition in light of its exchanges with Islamic thought, and a vital resource for contemporary debates about materialism in critical theory.